Ali ducks a Frazier swing. Photo by Time/Life. On March 8, 1971, Muhammad Ali battled Joe Frazier at Madison Square Garden in one of the most highly anticipated showdowns in sports history. Billed as “The Fight of the Century,” it promised to be a clash of styles, a clash of cultures, a clash of two legendary champions who had been kept apart due to the crazy politics of 1960s America. Ali was found guilty of violating the Selective Service Act. Upon his conviction he was stripped of his title and suspended from boxing by the New York State Athletic Commission. Ali challenged the suspension on equal protection grounds – dozens of felons and ex-felons were then (as now) licensed to box. Though Ali eventually won his case, becoming a prominent anti-war spokesperson in the process, he lost more than three years of his prime before he was allowed to box again. In the meantime, Joe Frazier had pummeled the competition en route to becoming the new heavyweight champion. When he agreed to fight Ali, neither man had ever lost in the ring. What better venue for such an epic fight than Madison Square Garden? The pre-match hype went beyond boxing. To much of the country, Ali was an anti-American radical, which he embraced by calling Frazier “a dumb tool of the white establishment,” “an Uncle Tom…too ugly to be champ.” Re-watching the video, it appears that the majority of the MSG crowd backed Frazier. The fight took place in the current Madison Square Garden by Penn Station, the fourth “Madison Square Garden.” The first two had been on Madison Square Park, hence the name. The new MSG had opened only a few years earlier. 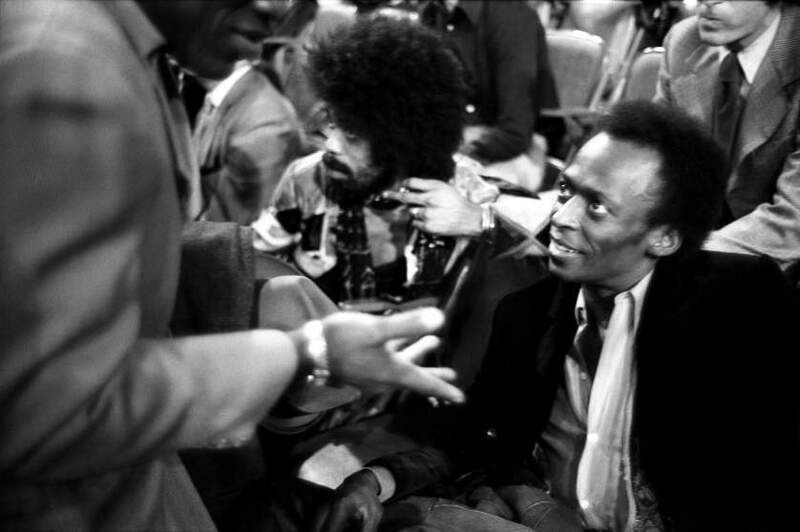 The King of Cool, Miles Davis, in attendance. Photo by Time/Life. MSG’s Celeb Row was in full effect for the Fight of the Century, with ringside appearances by Miles Davis, Barbara Streisand, Hugh Heffner, Woody Allen, Norman Mailer, and Sammy Davis Jr. Dustin Hoffman and Diana Ross were kicked out for not having tickets, and Frank Sinatra spared himself the same fate by procuring a photography press pass from Life magazine. More than 700 media outlets were on hand to cover the match, which 300 million watched at home on television. The fight itself lived up to the billing, a “slobberknocker,” as Jim Ross would say. Ali and Frazier traded blows round after round. Ali was a step slower than the champion of old, but he was right in the fight until Frazier clocked him in the 11th round. Ali recovered, but Frazier took control from there, knocking Ali down in the 15th and final round, and winning by unanimous decision. Perhaps Muhammad Ali’s life arc required bitter defeat to achieve full redemption. Shortly after the Fight of the Century, Ali prevailed in the courtroom. In Clay v. United States, the Supreme Court reversed Ali’s draft evasion conviction, holding that the grounds for his conscientious objector status denial was inadequate, a landmark decision. Meanwhile, a young phenom named George Foreman completely toasted Frazier to win the title in 1973. Ali defeated Frazier in their 1974 rematch, setting him up as the underdog contender against Foreman. In one of the great boxing matches of all time, Ali prevailed in the “Rumble in the Jungle,” finally winning back the heavyweight title that had been stripped from him in 1967. The next year, Ali and Frazier faced off a third time, Ali prevailing in the “Thrilla in Manila,” a fight so brutal that both boxers ended up hospitalized. Madison Square Garden has continued to uphold its title as “The World’s Most Famous Arena.” The Knicks may have gone without a championship since 1973, but MSG has been home to numerous legendary sporting events, concerts and political rallies. My personal favorite was probably LCD Soundsystem’s final concert in 2011. 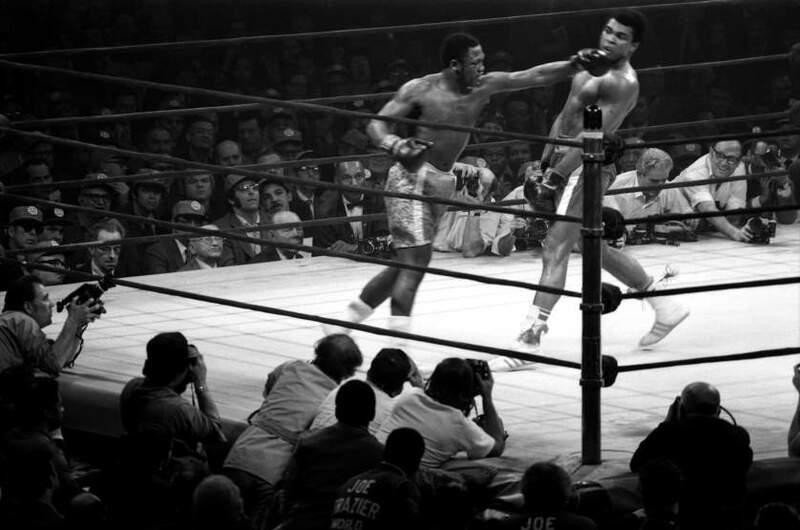 Yet, for all of MSG’s great moments, perhaps none will ever top the spectacle of Ali vs. Frazier.